Sheet metal assemblage. Poly-Fiber Medium-1 fabric, PolyFiber Top Gloss polyurethane pigments. The colors of the sheet metal drove the pigmentation on the background fabric. Sheet metal element from WWII-era North American T-6 trainer. PolyTak and PolyBrush structural adhesives. AN hardware. As I fly, there are only a few times and places where I see the primary colors. And usually not all at once. Mostly the colors are mixed; hues are variable; saturation seems random; sky and land merge at the horizon. 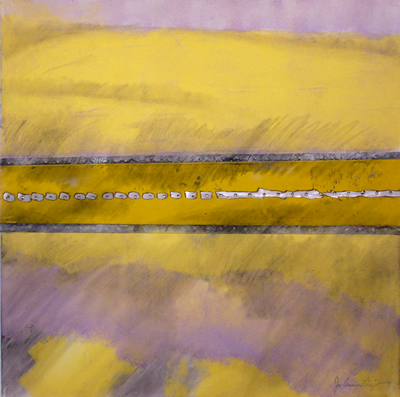 “Flight in Yellow and Purple I pays homage to color extremes visible on any given flight, dawn to dusk, east to west, left to right, in or out of reverie. Color brings life and brilliant things to the air and to the ground below the air. Color is bright and warm.It turns the dirt to sienna; water to pastel emerald mixed with engine noise; sky to a leather-scented blue wash.In no moment does this illusion stop, until the distance between Earth and wheels is zero.